22 Inch Storage File Cabinet White Both playful and studious, this youthfully designed soft-hued 22 metal storage file cabinet makes the perfect complement to the bedroom or study area of the student in your home. Ideal for both boys and girls, this intelligent storage cabinet is built to house all of the necessary school supplies a young scholar may need. Featuring a useful writing utensil drawer, a middle binder drawer, and a spacious and keyed entry lower file drawer perfect for storing expensive tablets or calculators, the learner in your life will love both the efficiency and fun colours of this academically inspired smart storage solution. 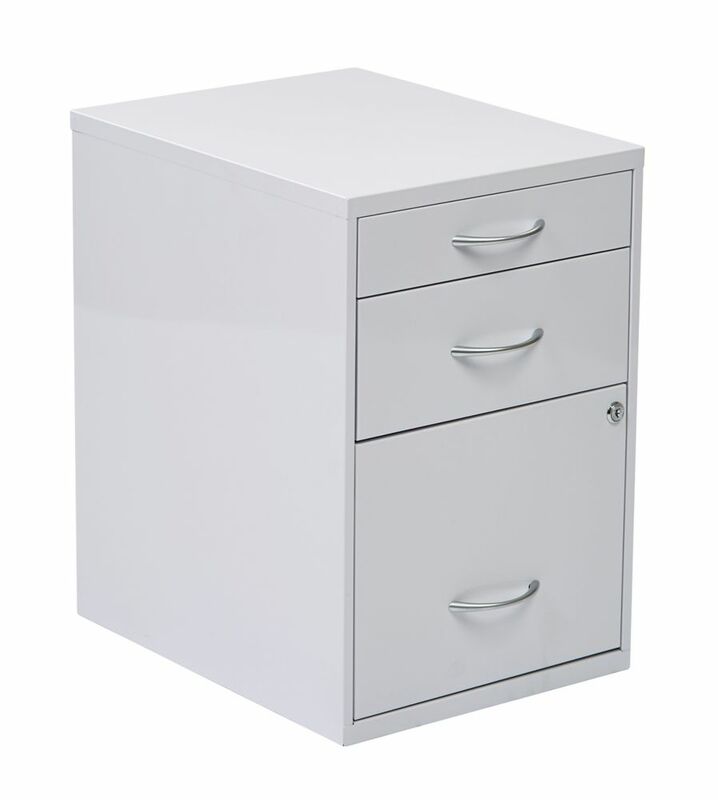 22 Inch Storage File Cabinet White is rated 3.4 out of 5 by 7. Rated 4 out of 5 by Gladys from Was shipped in good condition. Just wished it had... Was shipped in good condition. Just wished it had hanging rack in large drawer for files. Rated 2 out of 5 by perk123 from Like other reviews that I read, my cabinet arrived dented.... Like other reviews that I read, my cabinet arrived dented. I decided to keep it since the hassle to send it back makes it easier to just keep it. It works fine, just the aesthetic of having a dent is disappointing. Rated 4 out of 5 by Anonymous from Good cabinet, nice color Overall we are pleased with the file cabinets. However it would have been nice if each cabinet had been keyed differently. We got one cabinet for each employee. The fact that they all have the same key made the key pointless. Rated 4 out of 5 by Oofieb from Does the job The xtra drawers are nice. Plenty of room for my needs. Rated 5 out of 5 by Mike from Cute file storage I needed a small file cabinet for my office In the guest room.This was perfect. Rated 4 out of 5 by rubybegonia from suits my needs well It is harder to find white filing cabinets and these were just what I wanted--didn't need heavy ones and these are light enough that I could stack them and get exactly what I needed in my office. The only small hitch is that one of them was slightly bent on the side next to the lock. Rated 1 out of 5 by jjjj from worst purchase ever First of all: I placed the order for 6 cabinets, then received an email saying there was a problem with the credit card. I placed a 2nd order using a different credit card, then received an email or Order Cancellation. Then I received 12 cabinets. Second: These cabinets are flimsy and light. They wont last very long and they cost almost $100 each. We are sending them back.